Here is an overview on how to submit your entrie(s) to the ongoing competitions. Before joining a competition, please read the competition general info and rules carefully. 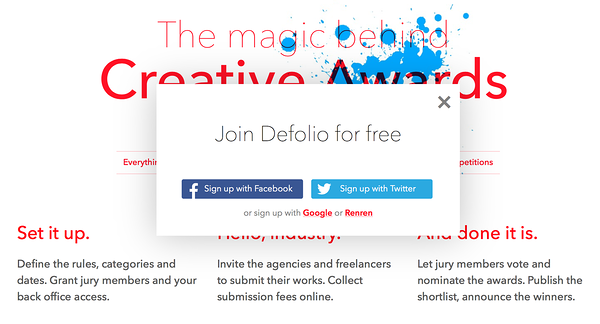 In order to proceed with submitting your entry, you need to sign up to Defolio by authorizing your account with Twitter, Facebook, Google or RenRen. Note that the organizers may need to get in touch with you once you have decided to take part of their competitions. Thats why we highly recommend filling out your account info fields. Click on Submit your work now and you will be presented with the submission form. Select the correct category before adding your information. At first you're able to add information to the form fields. Press Save and then Edit, to open up the attachments menu -- you can then upload images (in jpg or png format), pdf documents from your computer (or also via Issuu and Scribd links), audio files via Soundcloud and videos via Youtube and Vimeo. Note that your attached media should be available for public, since it's not possible to embed hidden or unlisted videos and audio files. If there is an issue with importing your media, the link will turn red and you should suggest checking up on your media privacy settings. 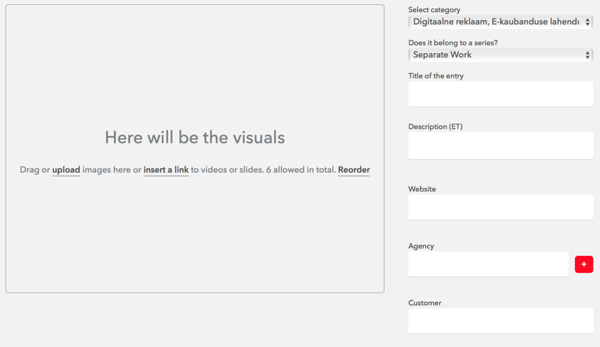 You will be able to edit your entries until the end of submission period thats displayed on the General page of the competition.